I have been infused with some serious crochet mojo combined with a touch of holiday spirit for the past few weeks. Now, you all know what that means...Oh yes, that definitely portends a bit of twist in my yarn! 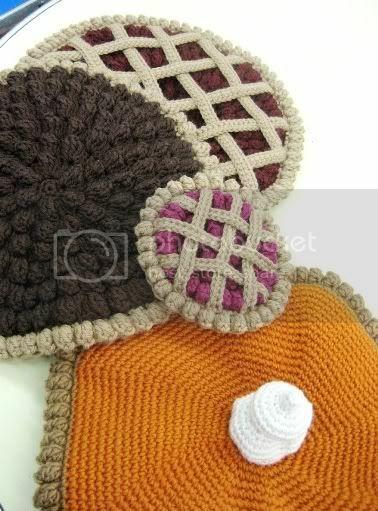 These crocheted versions of round flaky goodness are just in time for Turkey Day! And yes, you can be sure I will be wearing pie to my family's Thanksgiving feast. So, let's take a look at my crusty choices shall we? Thanks to Ellen for modeling! Bridget is modeling this lovely headgear! And my personal fave, the Cranberry Orange Pie-ret with lattice crust! Modeled by my girl, Jenna! It's a tough choice to be sure. 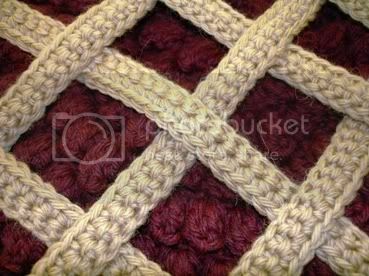 The Pecan and Cranberry Pie-rets were crocheted with an F hook and some of my Cascade 220 stash. An F hook combined with this light worsted yarn creates a very tight fabric. This is exactly the effect I was attempting to achieve as I was aiming for structure, not drape. My challenge during the design process for both of these Pie-rets was creating a perfectly shaped circle while using a popcorn stitch pattern. Needless to say, frogging ensued before I came up the correct increase to stitch ratio. I am happy with the results. 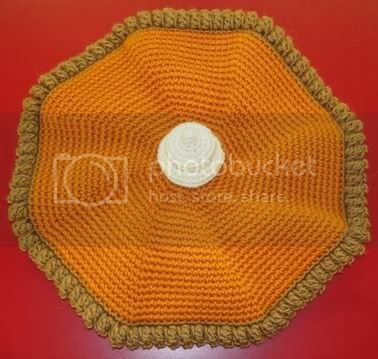 The Pumpkin Pie-ret was also crocheted with an F hook. However, I chose to use Lamb's Pride worsted for this one. Don't think I would choose this yarn again for this type of project. The FO ended up being too heavy for my taste. 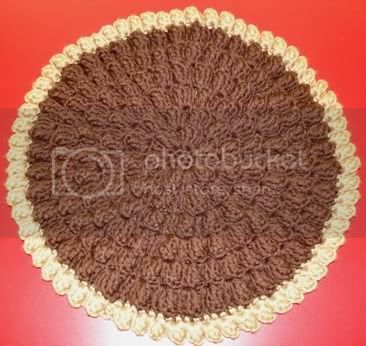 I will use Cascade 220 going forward should I ever decide to crochet another dessert-themed hat! Needless to say, one of these hats combined with Turkeyzilla the Tote Bag accessorizing my holiday outfit will surely embarrass my daughter to the core. It just doesn't get much better than that! Muhahahaha! 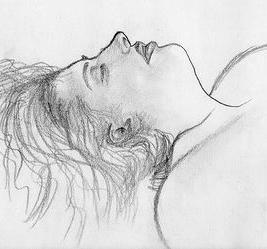 Copyright 2008 Regina Rioux Gonzalez. All rights reserved. Your pie-rets rock and are the perfect accessory for the holiday season. There is something about the dollop that really does it for me. I have serious Pie-ret envy! Those are awesome! Are you going to share a pattern or two with us? Pretty please?? Simply amazing. Thank you for bringing originality to Thanksgiving. I am already cutesy'd out. I think dessert themed headwear is much more intriguing than cute turkey placeholders and what not. Way too clever! Are you going to offer the patterns? I would love to make a couple for some friends who are pie fanatics! The lattice-crusted pie is my favorite--I thought it was a cherry pie! Festively delicious! Or deliciously festive! The latticed one is my favorite, too! OMG those are some nice and interesting hats. Do you teach a crochet class? I think my favorite is the Cranberry-Orange Lattice pie. I give my vote to that. Oh yeah, I love that dallop of cream. Have a "Happy and Blessed Thanksgiving. Well, I'm disappointed. Where's my fave? Where's my apple pie with a dollop on top? Just kidding!! LOL! You never cease to amaze me with your brilliant and clever creations. How DO you do it? Hope you and your family have a wonderful Thanksgiving!! fan-frigging-tastic! I love the pecan pie! These are wonderful! Please (pretty please with whipped cream on top) share your pattern. I would LOVE to make one for my sister the math teacher for "pi day" (3.14)! These are totally mad and I love them! I made your recipe for cranberry lattice pie last year (yum! ), would LOVE to crochet one as well! Oh jeez, those are awesome. 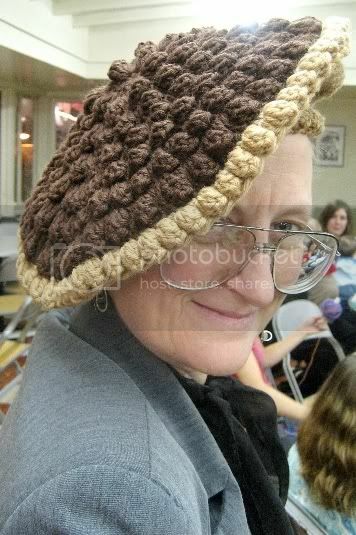 I, too, would love to figure out how to make a pie hat. Those are made of awesome. You've got to get some killer comments on those. As a side comment, I decided to have a contest on my blog and, as I was posting it, you came to mind. I can't imagine why *winknudge*, but I figured I'd let you know. These are CRAZY CUTE! I love how much the texture of the pecan pie is realistic. Wonderful wearable fiber sculptures! These are the most awesome of the awesome! Not only are they tasteful, but they're zero calorie -- it goes to your head not your thighs! What a wonderful way to have your dessert and wear it too! Your patterns are some of the most creative I have ever seen. Makes me want to learn how to crochet (I am a knitter :P) The pie hats are wonderful- you really should start your own etsy shop. These are the goofiest hats ever. I'll add my plea for the patterns. I'd certainly be willing to pay. 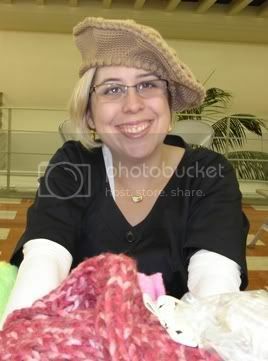 :-) I linked to Ravelry, so hopefully you'll have many more of us begging for the patterns. I have no talent, but I have a little bit of money - can I buy one?? Dude - you made BoingBoing!!!! These are so very awfully cute, but I want baby-sized directions. I have brand-new twin nieces, and I think that cherry tart hats would be just the ticket. Lovely. Precious. Even my fiance thinks these are cool. SO makeable... umm, that is if I had a PATTERN. I will BUY the pattern if you make it available... please let me know if you do! Love all of your pie-rets, but I have to say the cranberry lattice is my favorite. So impressed as usual. Also, after Thanksgiving dinner, my daughters boyfriend was describing some amazing things he's seen in knitting and crochet on the net, and the most mentioned items were yours. I had to do a "wait a sec, I know who you're talking about!". oh my sweet jesus... i will die if you do not post a pattern for me to buy!! i will actually die! Ok, you are a sick, gifted, fantastic lady!! I love these on so many levels. I need this pattern and will pay pretty much anything for it. Ya see, I own Cutie Pies, a little pie company in Rhode Island. I want to make these for all my employees to wear around the shop. i haven't even begun to read your posts yet, but i am DEFINITELY cracking up at your ideas -- your work is SO CLEVER! now i want to make a pie-ret for my pie-baking mom, whether or not she wears it. keep up the good work. i'm having fun visiting here. 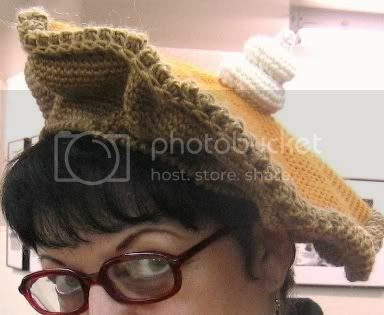 I loved your hats so much that I made my own version of the cherry pie hat and wore it when I went Christmas shopping. I made a lot of people laugh. I loved it. Thanks for the wonderful idea. 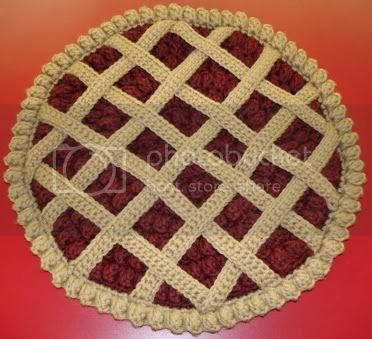 i LURV pie... and crochet... and this hat makes me so happy that theres someone in the world that is GENIUS enough to make this! :D i love your amazingly unique creations!! Hi! I love these patterns and ordered them a few days ago, but haven't received the pattern. My e-mail address is queenjadia@gmail.com. Also, is it okay with you if the hats I make from this pattern are sold at a silent auction to benefit my school's volunteer group? Hi there! I'm trying to buy the pattern to the pie-rets and the button doesn't like me - how can I order and pay you? Thanks so much! These are adorable! I'm a knitter, but I'd learn to crochet to make these! 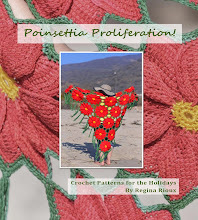 Pretty please share the pattern? PLEASE whip up knit instructions for the pie-rets?! 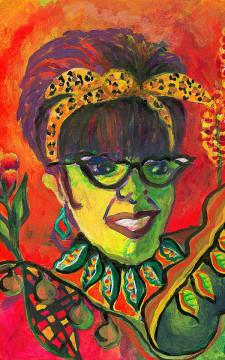 You are talent personified! I wanna eat all your hats! I so badly want to make one of these to wear to my families Thanksgiving dinner! How long does the lattice one take to make? I would like to order your pattern for your pie hat but the button is broken. Are you offering the pattern through Ravelry? Me too: I'd like to buy your pattern, but can't continue after selecting "add to cart." Help me, OB-1. You're my only hope. Thanks. Holy crap, these are friggin' AWESOME!!! Any chance you might offer a knitted version of these patterns? 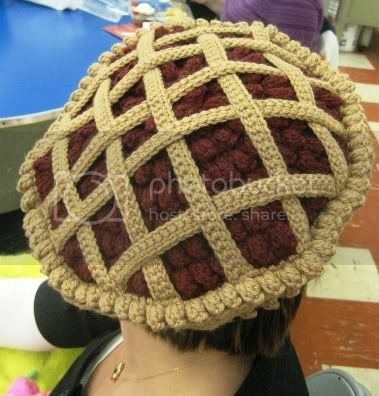 I want the lattice crust hat so badly, but I'm a knitter! Pretty please with a dollop of whipped cream on top??? My email addy is two_sirius *at* yahoo *dot* com if you want to respond that way! Funny that the last poster mentioned the Facebook placement photo - because that's how I found you! I saw the pie-ret and immediately became both intriqued and slightly frightened. When I realized Kenmore had duped me into clicking to THEIR site, I googled until I found you. You are my hero. And these are so awesome I'm tempted to try to learn to crochet again. I've a craving for strawberry-rhubarb lattice pie on my head. These are really great, I found your pecan hat at http://supervegan.com The site made reference to you, and so of course I had to take a look, these are GGRRRRRRREAT! 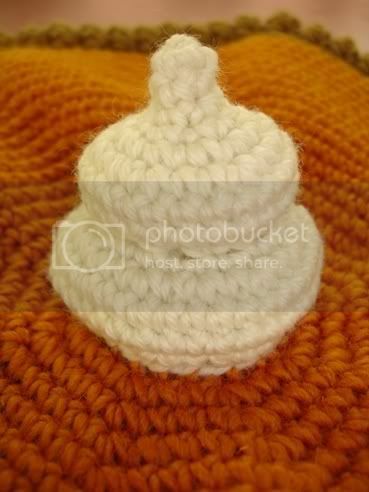 OH MY GOD I AM IN LOVE WITH ALL YOUR FOOD CROCHET WORK!!!!! very coincidentally I'm also into food AND monster crochet and I found your blog by accident, so lucky I did. Just followed you on Instagram, I just want to say your stitchwork is so perfectly neat I'm super impressed!! !